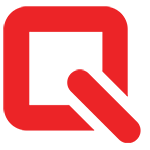 QCOSTARICA by Michael Miller –Costa Rica is known for producing some of the world’s best coffee. So you would think that every place you go in San Jose, you would get a great cup of coffee. Just like in the United States, Costa Rica has no shortage of places that sell mediocre coffee. Most restaurants, bakeries, virtually all the local diners (called “sodas”), and even some of the places that bill themselves as “coffee shops,” have substandard pre-ground coffee that is brewed in industrial size urns and served hours after it is made. But there are some select locations around Downtown San José that take coffee seriously. What follows is a list of some of the establishments where you can consistently get a good cup of coffee. The first one on the list might surprise you. Two big chains from the USA, McDonalds and Starbucks, provide consistently good coffee, and draw big crowds on the Plaza de la Cultura in the heart of Downtown San José. That’s right: “Micky Ds.” Several of the larger Downtown locations of this ubiquitous hamburger stand have installed what they call the “Mac Cafe”. The Mac Cafe is a coffee counter within McDonald’s, separate from the main counter where you get your McNuggets and fries. And the Mac Cafe always has surprisingly good coffee. Here you can get a good cup of coffee and all the popular variations: Lattes, cappuccinos, expressos, etc. The Mac Cafe in the McDonald’s on the Plaza de la Cultura, in the heart of Downtown San José, has a comfortable lounge and good reliable WiFi service. Two doors down from the McDonald’s on the Plaza de la Cultura, a Starbucks outlet opened in late 2015. The Starbucks stores in Costa Rica are not much different from the ones in the USA, or anywhere else, for that matter. They offer good coffee and over-priced cookies and pastries. The one noticeable difference from a USA Starbucks, is that in Costa Rica they do NOT have milk or half-n-half at the serve-yourself counter. For some reason, Ticos just can’t imagine why anyone would put cool milk into their coffee. The Starbucks location at the Plaza de la Cultura has two floors of seating, and excellent WiFi service. 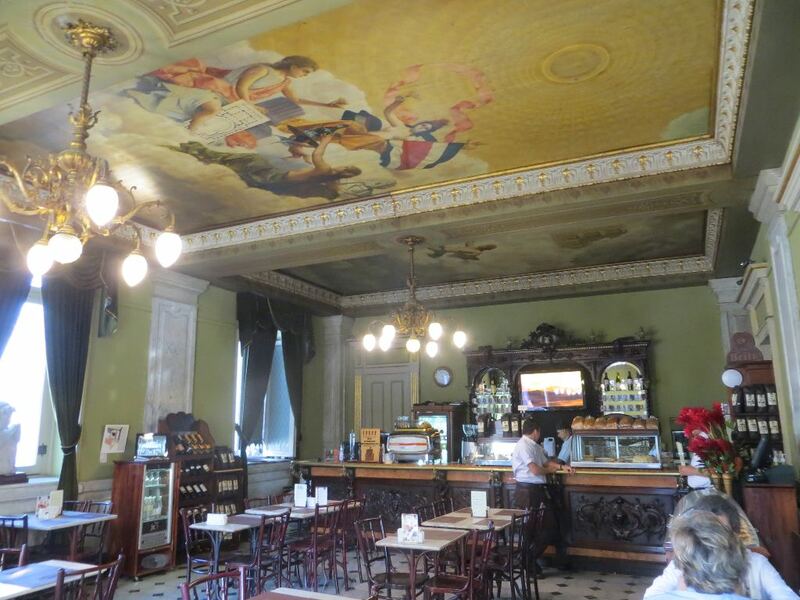 The stately elegance of the cafe at Costa Rica’s National Theater (Teatro Nacional) make this the most beautiful place to enjoy a cup of coffee in Downtown San José. Across the Plaza from McDonald’s and Starbucks is Costa Rica’s magnificent National Theater. The cafe to the left of the Theater’s ornate lobby is easily the most beautiful place in San José to get a cup of coffee. There are classical murals on the ceiling, art hanging on the walls, European chandeliers, waiters in white shirts and black slacks, and the feel that you are in someplace special. If you arrive just prior to a performance at the Theater, you will find the cafe teaming with theater-goers and well wishers. 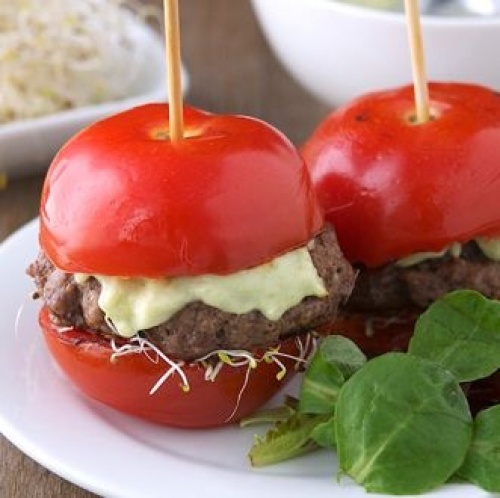 You can also get snacks or a light lunch there. 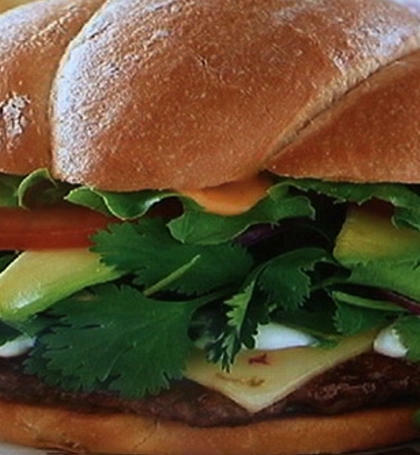 The menu features soup, sandwiches, wraps, and pastries. And I have it on good authority that the mushroom quiche is delicious. No WiFi service. 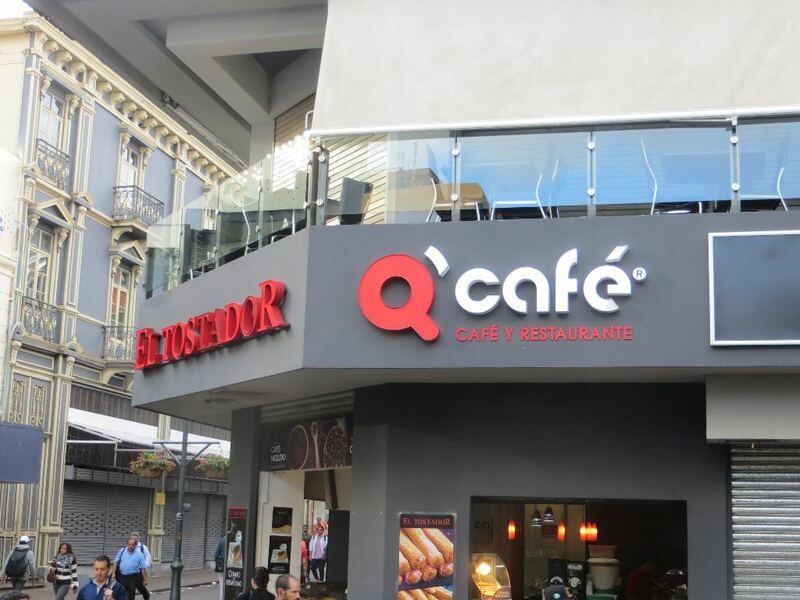 On a busy corner of Avenida Central, Q Cafe with it’s second-floor tables, is a popular restaurant that offers good food, non-stop people watching, and very good coffee. Q Cafe is a good restaurant with good coffee. 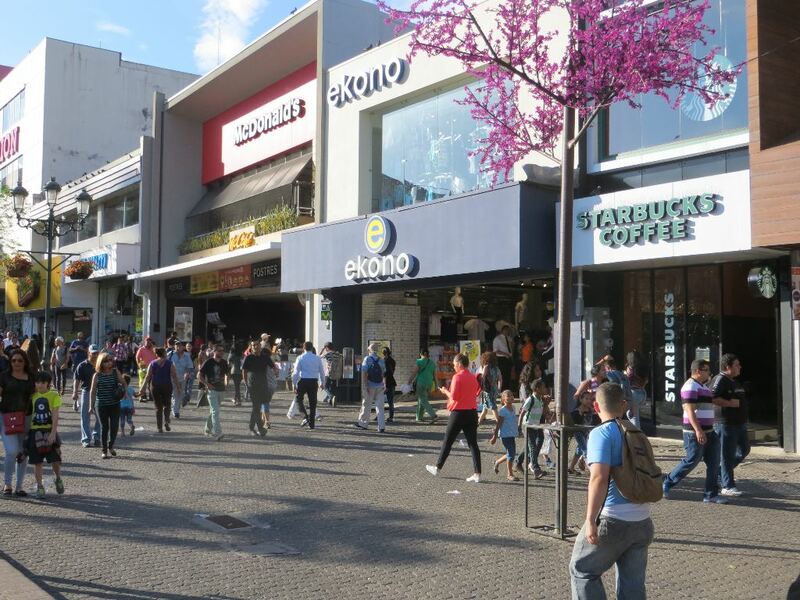 It is located in the busiest part of the very busy Avenida Central, one block south of the main Post Office (that’s Avenida Central and Calle 2). Here you can get an excellent lunch or dinner, but many people drop in just for coffee and snacks in the middle of the afternoon. One of the reasons for Q Cafe’s popularity is because it is on the second floor of a corner building. If you can manage to get a table by the windows, you can spend an hour relaxing and watching the non-stop bee-hive activity on the avenue below. Another reason for its popularity is that you can get a slice of pecan pie or a chocolate brownie with your coffee. And yes, you can get them á la mode. The tiny Cafe Miel, in historic Barrio Amon, is a popular meeting place for students and young professionals. In Barrio Amon, the neighborhood behind the Holiday Inn Tower, there are two tiny branches of a new coffee shop called Miel Cafe. 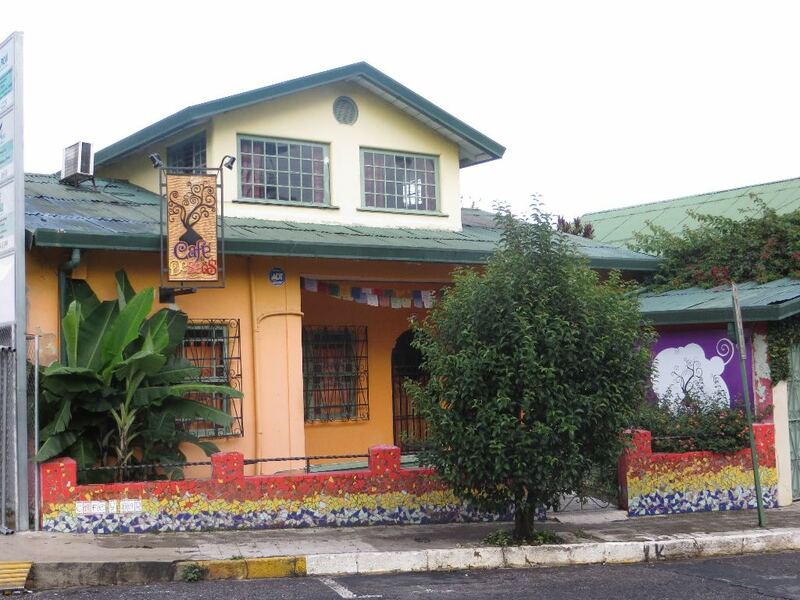 The easiest one to find is on Avenida 9 and Calle 13, just up the hill from the landmark Hemingway Inn. 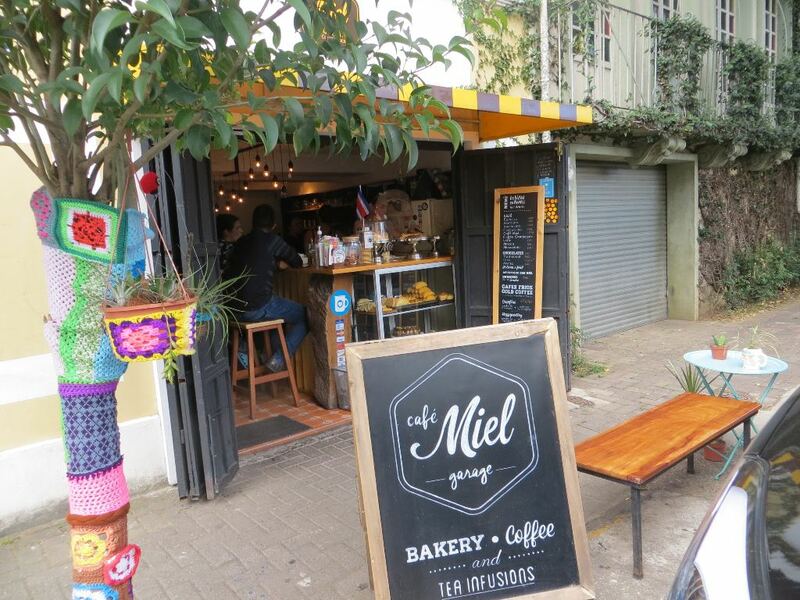 Although they are very small, the Miel Cafes have become very popular, especially with young Costa Ricans. 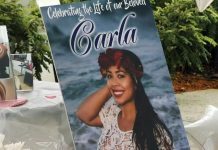 Often in the afternoon and early evening, you will see overflow crowds of students and young professionals hanging out here. This converted home on the railroad tracks near Hospital Calderon is the trendy Cafe Deseos. If you want trendy, Cafe Deseos is your place. Located on the railroad tracks, about 25 meters behind Hotel La Armistad (Avenida 11 and Calle 15), Cafe Deseos has been described as “hip” “eclectic” and “cutting edge.” Although the name says “cafe” it is more of a light restaurant with a tapa style menu. It also features draft beers and sangria. Late afternoons, you may find it filled with people off work from the nearby Hospital Calderon and the surrounding medical offices. Note that Cafe Deseos opens at 2 p.m., so it won’t help you find your morning cup. Good WiFi service. And now, I have saved my two favorite places for last. 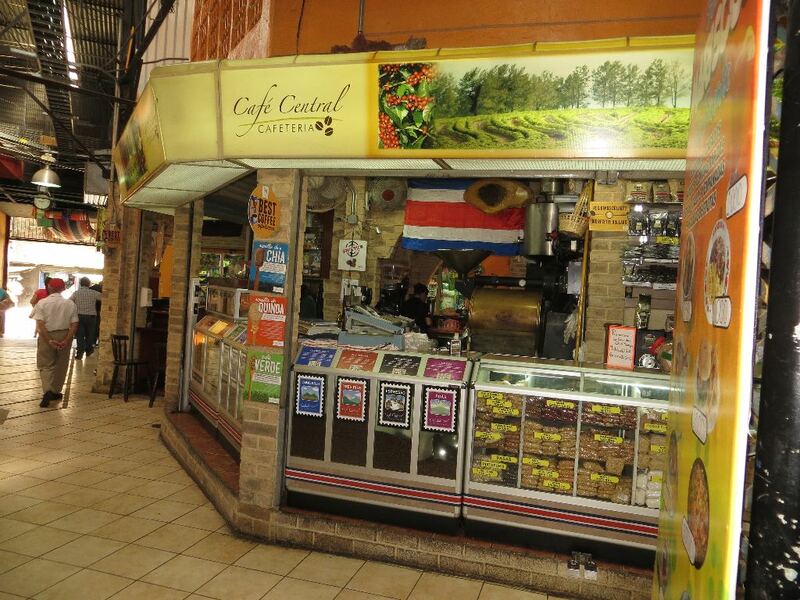 Cafe Central in downtown’s Mercado Central, is considered by many coffee aficionados as the premier place in San José to buy freshly roasted coffee beans. Located in the busy Mercado Central, Cafe Central sells rich wonderful coffee by the cup, along with a selection of pies and pastries. However, most people visit Cafe Central to buy kilos of whole bean coffee to take home. Here the proprietors, Adrian and Patricia, will describe the characteristics of a wide variety of beans from different regions of Costa Rica; places like Tarrazú south of San Jose or the slopes of the Poas Volcano. The beans come to Cafe Central raw and are freshly roasted right behind the counter. If you are planning to buy whole bean coffee to take back to the U. S. or Canada, be sure to tell them. They will put the appropriate stickers on the bags so you will have no difficulties getting them through customs. There is no WiFi service here, but since it is inside the Mercado Central, there is always plenty to see. 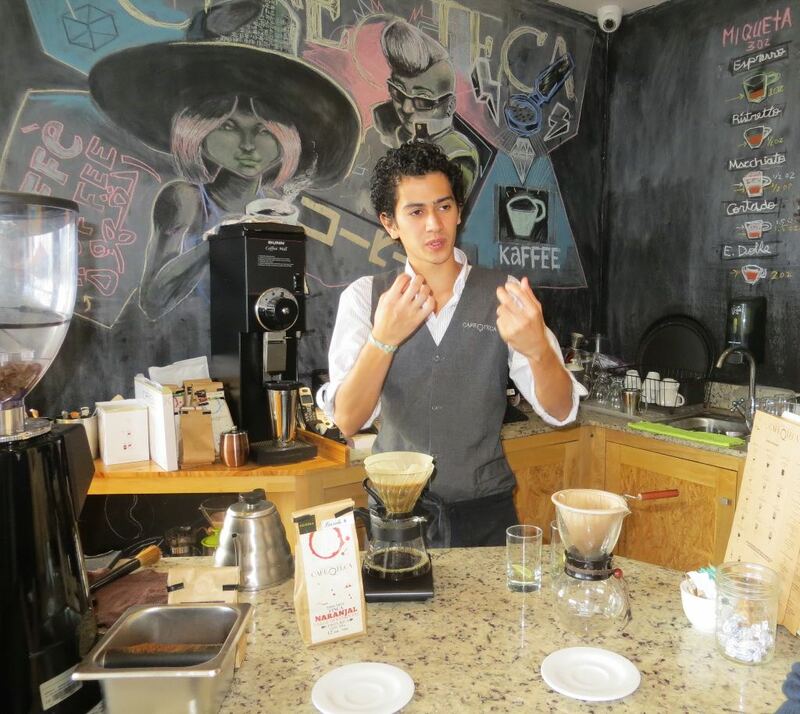 Highly skilled barista, Remy Molina, explains the many factors that can influence the flavor of fine coffee, at Cafe Oteca (part of Restaurant Kalu) in Barrio Escalante. And yes, Remy was named for the famous cognac, Rémy Martin, which his father was drinking when he was born. If you want to take your coffee-tasting experience to a higher level, you need to visit Cafe Oteca. This is a coffee shop within Restaurant Kalu in upscale Barrio Escalante, a neighborhood that is quickly becoming the gourmet capital of San José. Here, whole gourmet coffee beans are freshly ground and brewed for each individual cup. If you arrive at Cafe Oteca when they are not busy, you might get a chance to talk with Remy Molina, or one of the other knowledgeable baristas. They will explain the features of the coffee beans they offer from different parts of Costa Rica. Beyond that, they will also explain how different methods of picking the beans, storing the beans, and brewing the coffee can affect the taste of your cup of coffee. Like a wine-tasting, you can learn to pick out flavors that develop naturally in really fine coffee; flavors such as black berry, chocolate or hints of orange. Cafe Oteca and Restaurant Kalu are on Avenida 5 and Calle 31, one block west of the popular restaurant row known as Paseo Gatronomico La Luz. 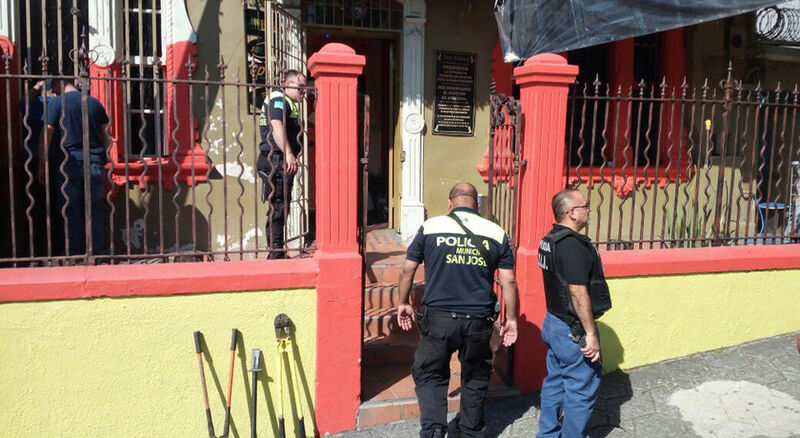 This is in Barrio Escalante which is a short cab ride from the Downtown area, between Downtown San José and San Pedro. Good WiFi service. Closed on Mondays. 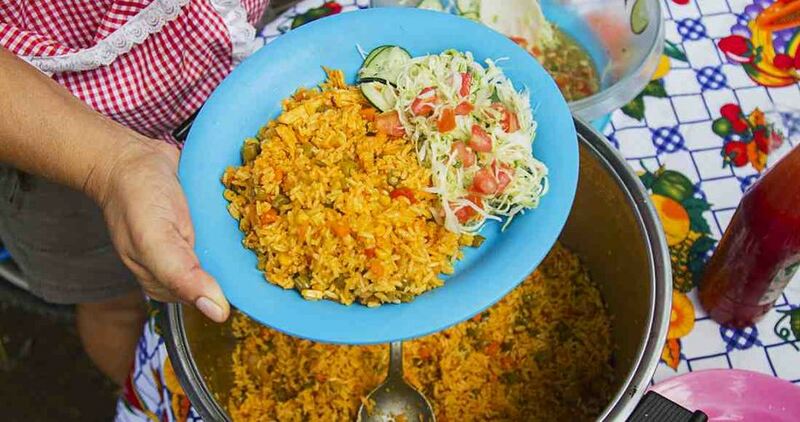 I received valuable help for this article from Roberto Guzman of Chepe Cletas, Remy Molina of Cafe Oteca, and bi-lingual guide Nury Mora-Vargas. 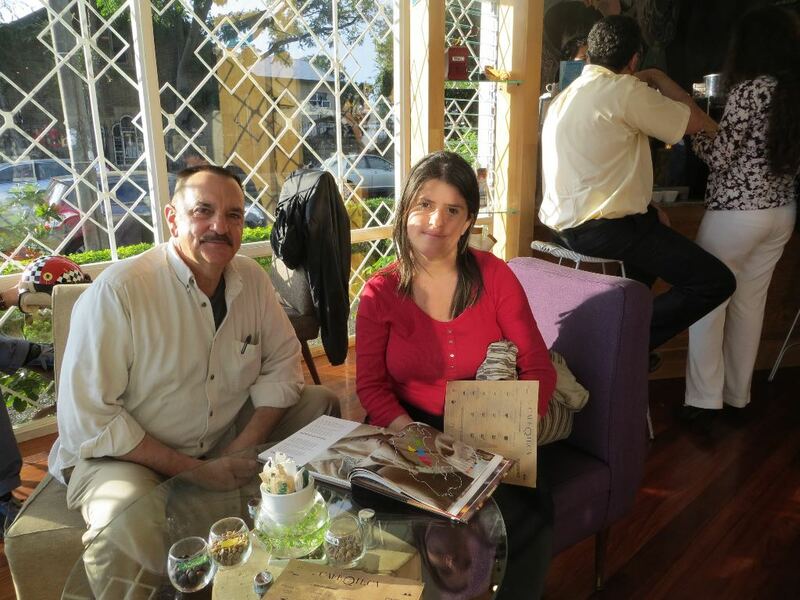 Author Michael Miller with famous San Jose guide, Nury Mora Vargas, study the different coffee growing regions of Costa Rica at Cafe Oteca. 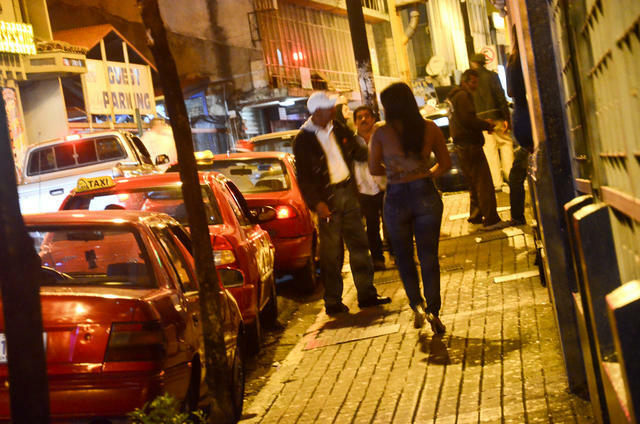 Michael Miller is the author of the first and only guide-book that focuses on Downtown San José, Costa Rica, titled: The Real San José.